Currently, almost any person tries to earn much money to improve his living conditions, help his family, solve various difficult situations and satisfy his needs. To reach such goals, some people may look for well-paid jobs, attend psychological trainings, choose for prestigious professions and invent new devices, while others decide to start their own business careers. Usually, plenty of businessmen prefer to establish shops and malls, as these business projects can provide their owners with impressive funds and high popularity. However, implementing their trade operations, vendors must possess enough financial resources to pay taxes to governments and salaries to their personnel. Hoping to decrease costs and get additional profits, merchants can start selling products via their individual web stores. As a rule, these online businessmen also have to spend much money on maintaining their web business projects and creating advertising campaigns, if they want to stand out of the crowd of competitors and achieve their personal business goals. In most cases, as plenty of web store owners can't boast of having large budgets and getting high revenues, they have to stop their business activities and forget about the online business environment for a long period of time. Aspiring to avoid unsuccessful business practices, some merchants decide to join online multiple marketplaces. This approach is considered to be both useful and effective, as it allows vendors to save their ventures from collapse and get regular profits. What Is Virtual Shopping Mall? For the last several years, a number of virtual shopping malls have increased dramatically, as such business projects help entrepreneurs stand in cruel conditions of high competition and save their financial assets. For example, a multiple marketplace vendor shouldn't update and customize their web stores, as all development procedures are accomplished by marketplace owners. As for marketplace owners, they will be able to improve their business positions and increase their revenues dramatically, as they will interact with hundreds of independent vendors and different customer segments from all over the world. Nevertheless, launching a web multiple marketplace, a businessman should be ready to provide clients not only with required products and services, but also with rich customer experience. When buyers visit web stores, they want to see fast loading website pages, high performance, comfortable navigation systems and stable working customer applications. So, if you are one of those businessmen, who dreams to become a marketplace owner, I think it will be interesting for you to research my article, where I outline main advantages of launching virtual shopping malls. Managing their individual web stores, vendors have to resort to various marketing and promotion techniques to attract and retain online customers, as they risk to lose their brand identity and disappear from the ecommerce marketplace. Being an online shopping mall owner, you will get an opportunity to avoid these issues and increase your base of return clients drastically. In the other words, as online multiple marketplaces can include up to several hundreds of separate online shop departments, so buyers will be able to find and order desired products in a single place without spending much of their precious time on searching procedures. Taking these facts into consideration, more and more shoppers decide to go shopping in online marketplaces. Moreover, visiting a virtual shopping mall, online buyers can save not only their time, but also their financial resources. This is rather obvious, as every marketplace merchant will sell his products at his own price, what will allow all possible customer segments to make purchases, depending on their budget limitations. Besides of it, you will also be able to equip your online business project with a wide range of customer services and applications to provide clients with rich customer experience. You can be sure, that customers will like such steps and start visiting your web marketplace more often. When online businessmen have already made plenty of deals and sold a large number of products, they usually want to achieve new business heights. Trying to make their business dreams come true, some ecommerce vendors can create sophisticated advertising campaigns, work out effective business plans, buy new web store software and especially make friends with influential businessmen. Enlisting well-known brands' support, a merchant will get more chances to outdo his competitors and add credibility to his web shop. However, everything is not so simple, as it may seem, as thousands of vendors aspire to do all their best to impress these authoritative business companies with valuable business propositions. Launching a virtual shopping mall, an online businessman will get a perfect tool for searching and interacting with new business partners, as different business companies and corporations are always interested in large online startups. So, if they will choose your venture for further cooperation, you will be able to occupy one of the leading positions in the ecommerce marketplace and even compete against well-known business giants, such as Amazon and eBay with time. Ordinary online businessmen should possess enough skills and experience to manage their web stores and serve their clients, if they want to continue accomplishing their trade operations. As for web shopping mall owners, they must be ready to control their online business projects, track online mall vendors' activities and provide customers with smooth and fast shopping procedures. Furthermore, as I have mentioned above, if you organize an online multiple marketplace, you will also have to customize and develop independent merchants' web store departments on your own, as it's a marketplace owner's duty. 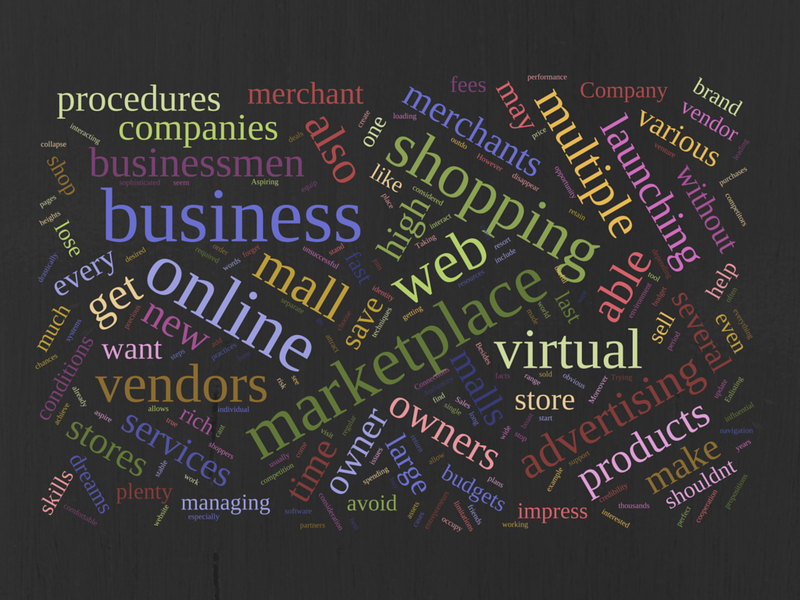 So, you may be asking yourself: why should I launch a virtual shopping mall then? The answer is simple - fees. When a vendor joins an online multiple marketplace, he gets a unique chance to sell his production to various customer segments without thinking about development procedures. But such a merchant will have to pay certain commissions to a marketplace owner for the right to accomplish their business activities. Every marketplace owner can set his own fees. Just imagine how much money you will get every month, if you will be able to invite several hundreds of ecommerce vendors into your web marketplace! To make your life even more easier, the payment can also be collected easily using various online payment services like Paypal and more that accept payment through credit cards, debit cards and more. In modern conditions, it's rather difficult to compete against business companies and ventures without having creative advertisements. Currently, online businessmen try to invent and use all possible advertising methods and strategies to promote products and services they offer to clients. Hoping to impress customers' imagination, ecommerce vendors have to spend significant funds on creating and organizing promotional campaigns, what can negatively influence on their budgets and business processes. As a result, these merchants may lose all to the last cent and their online startups will vanish among other business brands. Researching advantages of virtual shopping malls, I also have to mention their advertising features. When you organize a virtual shopping mall, you shouldn't worry about your advertising campaigns, as your vendors will do all instead of you. This means that joining your online marketplace, merchants agree to follow all points of a marketing policy of your virtual shopping mall, including promotional and advertising ones. Such an approach will help you strengthen your business positions and build a strong brand name for your company. A virtual shopping mall is that business project, which can provide you both with high revenues and grand business opportunities. After analyzing and realizing all sides and aspects of launching and managing these online multiple marketplaces, you will be able to enter new business directions and cooperate with more authoritative business companies, as well as expand your business and marketing channels. Nevertheless, you should always get the newest knowledge and improve your current skills in management and marketing fields, as your marketplace seller and buyer communities will constantly grow and puzzle you with new problems and requirements. 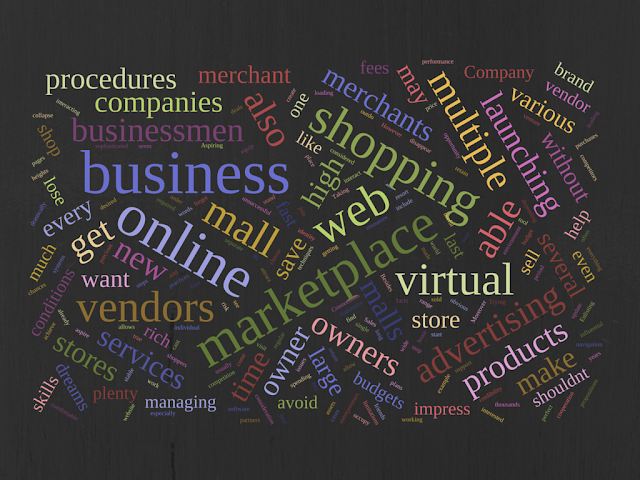 Do you have any additional information as for advantages of launching virtual shopping malls? Feel free to share you thoughts with me in comments below. Nicolas Fincher is a marketing and PR manager working for the CS-Cart ecommerce software company, which offers the comprehensive range of multifunctional shopping cart tools, including CS-Cart and Multi-Vendor software.